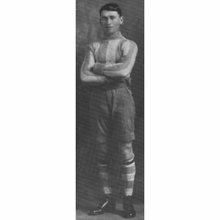 Reserves coach Charlie Hardy (born April 01 1887) played 224 games with North Melbourne 1908-21 and Essendon 36 games, 1921-25. Senior coach at Essendon 1928-30 and St.Kilda 1931-32. He was also coach of the third eighteen. Alan Geddes (born Nov. 04 1903) played 183 and kicked 14 goals with the Tigers 1925 - 1935, he is pictured in the 1928 Victorian team. Frank Murray played in a couple of practice matches and in at least one Reserves match this season. Followers; McLean (Capt), L. Eist? Goals; Watkins 5, Fox 3, Hill 3, Bavin 3, Denmead, Leo La Franchini 1.
.*Hollingshead played in the seniors. McInnes promoted to seniors as 19th man.
.* Jim Jones made his senior debut this week, same player? 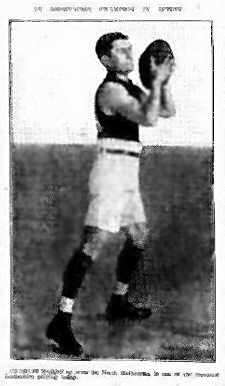 Carlton played Fitzroy at Brunswick Street. Second and Third Eighteen players were invited to a pie night in the pavilion on Monday night. The team met at Spencer Street station at noon. Mann was injured (hemorrhage of the lung) in a clash during the second quarter. He didn't return after half time and was taken to the Melbourne Hospital after the game. Played 13, Won 7, Lost 6, For 1168, Against 1194, 97.82%, 28 points.
.*Skinner played in the seniors. Followers; McElroy, Litton/ Edward Rippon?
. *All V.F.L. and V.F.A. matches postponed due to waterlogged grounds. Contributors to this page: blueycarlton , pblue , Bombasheldon and molsey . Page last modified on Thursday 02 of August, 2018 17:48:29 AEST by blueycarlton.